"A Final Opportunity Is Being Opened To Ortega. There Won’t Be Any More Than That." 14ymedio, Juan Carlos Bow, Washington, January 14, 2019 — The extraordinary session of the Permanent Council of the Organization of American States (OAS) on Nicaragua was closely followed by José Miguel Vivanco, director of the Division of the Americas at Human Rights Watch. He was in the same room with the ambassadors and representatives of the American countries, which this Friday carried out a “collective evaluation” as a first step to implement the Inter-American Democratic Charter to the regime of Daniel Ortega and Rosario Murillo. “If the Government doesn’t show signs of being ready to agree to the petitions that can be made within the scope of the OAS, then there will be no other solution than the definitive implementation of the Democratic Charter,” assured Vivanco, who spoke to [Nicaraguan digital outlet] Confidencial from his office in Washington. Confidencial: What is your assessment of the extraordinary session on Nicaragua, in the Permanent Council of the OAS? Did they initiate the invocation of the Democratic Charter? 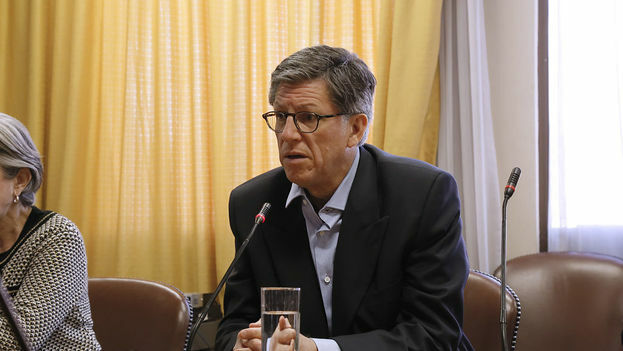 José Miguel Vivanco: It was really important because thanks to this meeting being held, the OAS initiates the implementation of the Democratic Charter to Nicaragua, to Ortega’s government. The Democratic Charter demands in Article 20 that for it to be implemented, some sort of collective evaluation must be done of the conditions of human rights and public and democratic freedoms in any country of the member states of the OAS. That was precisely the objective of this meeting. As of this session, political and diplomatic procedures can be carried out by member states, by the Working Group that currently exists for Nicaragua, and also by the secretary general of the OAS. For example, freeing political prisoners, putting an end to censorship and persecution of independent media outlets, reestablishing democratic order and public liberties, the independence of the judiciary, or a petition so that human rights bodies from the United Nations or OAS can be allowed access to the country. If the Government doesn’t show signs of being ready to agree to the petitions that can be made within the scope of the OAS, then there will be no other solution than the definitive implementation of the Democratic Charter, for which 24 votes are required. Confidencial: Do the political conditions exist to get the 24 votes in the OAS with the new position that López Obrador’s government in Mexico has adopted? Vivanco: It’s not going to be easy for that quorum to be reached, but I don’t see it as impossible. I understand perfectly that Mexico has changed its position; that under the current government of Manuel López Obrador, which controls and guides Mexico’s foreign policy, is the principle of non-intervention in internal affairs, whether or not they violate human rights. Something that is really archaic, belonging to the principles of the last century. Mexico demonstrated it today (Friday) because it stood out by its absence, didn’t open its mouth, didn’t make the smallest comment. It was in total silence throughout the entire session. I believe that despite the new position–lamentable, reactionary–of the current government of Mexico, the votes may indeed be there, because there is a greater and greater consensus that the situation in Nicaragua is one of impunity, brutality, and widespread and systematic abuse against those who don’t agree with the current regime. Confidencial: How are the political terms of the OAS planned in relation to Nicaragua, if Ortega has made it clear that he has no political will to hold talks? Vivanco: Indeed, Ortega in fact has demonstrated a dictatorial attitude, typical of a despot, that he is not prepared to exercise power in a manner respectful of legal values and of the obligations appropriate to the rule of law, to a democratic state. Here an opportunity is being opened, I would say a final opportunity, there won’t be any more than that. Once again, they implement, in the OAS, the Democratic Charter to anyone. The other country that is under the implementation of the Democratic Charter is Venezuela, in that case so far the quorum–that is, the 24 votes–has not existed, because of the pressure that Venezuela exerts on the countries of the Caribbean. But it is a country that is more and more isolated, discredited, and with less and less support. Nicaragua is not Venezuela, it’s not an oil power. It doesn’t have the political muscle that Venezuela has so far shown, even in ruins. For Nicaragua, the road becomes more difficult. Confidencial: Will a new commission be created or will it be the same Working Group of the OAS, which Ortega’s government refused entry, that carries out the diplomatic procedures in Nicaragua? Vivanco: The OAS already created the Working Group for Nicaragua, made up of 12 member states of the OAS, including Mexico, which has not withdrawn from that group. I don’t believe that a new group will be created, that one will arise. The Working Group for Nicaragua is precisely the one that has the mandate, the obligation, and the duty to continue reporting, to the rest of the nations of the OAS, the advances and setbacks experienced in political matters and human rights in Nicaragua. Confidencial: The Interdisciplinary Group of Independent Experts (GIEI, for its Spanish acronym) concluded that “crimes against humanity” have been committed in Nicaragua. How can they be prosecuted if that country doesn’t accept the International Criminal Court? Vivanco: It’s true that, not having ratified the Rome Statute, Nicaragua, unlike Venezuela, cannot be brought before the International Criminal Court, even if there is evidence that crimes against humanity have been committed, but there are other ways, like for example the Security Council of the United Nations, where a debate can be opened. I know that among the permanent members of the UN Security Council are Russia and China, which could serve to veto any effort against Nicaragua, but that remains to be seen. International relations, assessments that are made at a multilateral level, are always very complex and depend on innumerable factors. I believe that GIEI’s report can be very useful before the Human Rights Council of the United Nations. Confidencial: The resignation of the magistrate Rafael Solís from the judiciary and from the FSLN [Sandinista National Liberation Front] has surprised the leaders in power in Nicaragua. What international effect will this break have? Vivanco: It depends on what the Supreme Court magistrate can provide. It’s necessary to understand that this is someone who until yesterday was part of the Supreme Court and who was in his position while atrocious acts were being done and committed in Nicaragua, and he continued participating as a magistrate of the Supreme Court. We’re still lacking information to better understand the role he played during those months. Whether or not there was an internal debate; he says that the decisions that affect the courts are made by the Executive, it would be good for him to provide more information that would serve to better understand the responsibilities of certain other authorities, other than Ortega and Murillo, who we obviously know are, in the end, the ones who control the country and run it as if it were their private estate. Confidencial: The sanctions derived from the Nica Act and the possible authorization of the Democratic Charter can weaken the regime, but Ortega clings to power like Nicolás Maduro. Is the situation of Nicaragua comparable to that of Venezuela, to project that Ortega could remain in power until 2021? Vivanco: The Nica Act, which is a kind of Magnitsky law dedicated exclusively to Nicaragua, allows sanctions of the corrupt and violators of human rights, where it turns them into practically toxic personages. That is to say, the sanctions can be really draconian, and we believe that many of those who make up part of this dictatorial regime deserve it, because of the responsibilities that they have for extremely grave violations and for covering up these acts. It’s an extraordinary tool, that is not available for Venezuela, that is not available for other nations in the world. It has the support of Democrats and Republicans, here there is no doubt in any sector that we are facing a ruthless regime. In that way, I have great hopes that the Nica Act can serve to compel the regime to move from a dictatorial system to a democratic system. Confidencial: So you don’t see a parallel between Nicaragua and Venezuela, do you see it as a possibility that Ortega can leave before 2021? Vivanco: I don’t see any, there is no relation between one case and the other, except that the atrocities are similar. We are talking about two populist dictators, who they say are leftwing and who seek to remain in power at any price, where they are prepared to use brutal repression, if that is the only way to preserve power, and where additionally power is totally concentrated, there are neither authorities nor judiciaries nor democratic institutions to anticipate or sanction abuses. But, they are two cases that do not have points in common, from the point of view of what are the strategies, and of what will be the future of these two dictatorial regimes and their relation with the rest of the world. Editors’ note: this text was originally published by the Nicaraguan digital outlet Confidencial, which has authorized us to reproduce it here.